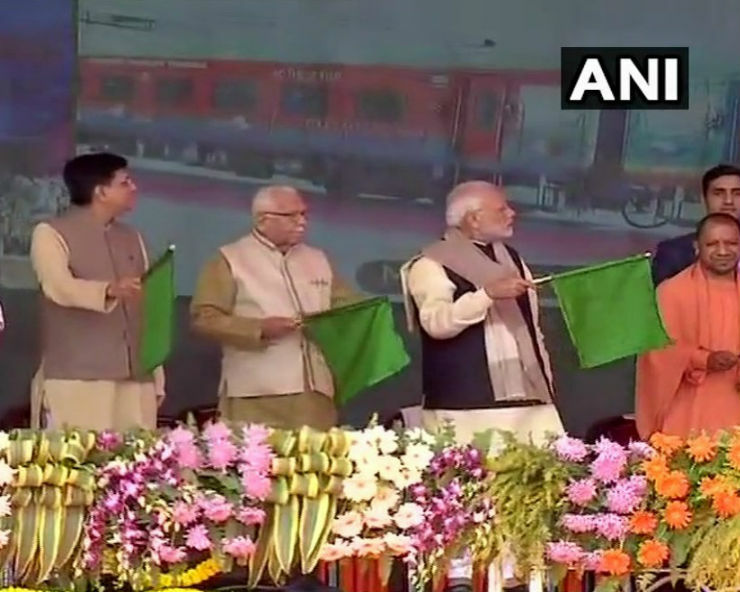 Rae Bareli: Prime Minister Narendra Modi inspected the Modern Rail Coach Factory (MRCF) here on Sunday and flagged off the 900th coach and a Humsafar rake of the factory. Railway Minister Piyush Goel, along with UP Governor Ram Naik, Chief Minister Yogi Adityanath and senior railway officials were present during the inspection of the manufacturing process of coaches at MRCF. In the factory, the Prime Minister showed his interest in the robots which are used for manufacturing of the coaches. He also went inside a Humsafar coach and took interest in the facilities provided to the passengers there. Mr Goel, and the officials of the MRCF explained the PM about the facilities and the other programmes of the factory and how the coaches are being manufactured. Recently, Railway ministry had doubled the production of the coaches in the MRCF from 1000 per year to 2000 per year. MRCF produces state-of-the-art LHB Anubhuti coaches, which have ergonomically designed cushioned seats, LCD screens, modular toilets and stylish interiors. These coaches will progressively be introduced on the Shatabdi and Rajdhani Express trains. UPA chairperson Sonia Gandhi laid the foundation stone for the factory in February, 2007 and land acquisition for the project commenced in April, 2007. However, in 2008, following the victory of the Bahujan Samaj Party in the Uttar Pradesh elections of 2007, the new government under Chief Minister Mayawati cancelled the land deed for the factory halting construction work there. The Allahabad High Court permitted the project to proceed after a public interest litigation petition was filed before it. In January 2009, construction of the factory began again which was inaugurated once again by Sonia Gandhi. The same month, Indian Railways signed a 99-year land lease agreement with the Government of Uttar Pradesh. The delay led to the cost of the project rising from an initially estimated Rs1685 crores to about Rs 2500 crores.